You can quite easily add The File Eraser to the Send To context menu of MS Explorer and / or remove! This works with BlankAndSecure in Windows 10 (8.1, 7) and all other Win systems! The Send To menu will also appear in all other programs that use the "Send to" menu, in example the Quad-File-Explorer Q-Dir! Info: You can use this solution, for all other programs that accept file lists as parameters! 1.) ... Add to "Send To" context menu in MS-Explorer! 2.) ... 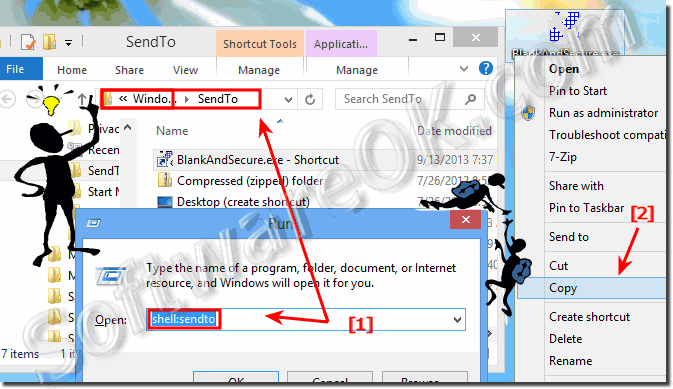 Remove from the "Send To" context menu in MS-Explorer! 3.) ... Other options to transfer files or lists of files to "Blank And Secure"! 5.) ... From version 5.11 you can also shred the trash content! 1.) Add to "Send To" context menu in MS-Explorer! First, you click the right mouse button on BlankAndSecure.exe (or other Program) and select the option "Copy"
Then easy press the [Windows+R] key combination and enter the command shell:sendto in the Windows Run-Dialog. To see the SendTo directory (folder) in the MS Explorer (... see Image-1 Arrow-2). In the "Send To" folder, you can now access via the right mouse button menu and select "Paste Shortcut". (... see Image-2 Arrow-1) . Optionally, you can also add the shortcut via right mouse drag & drop action to send selected files or folders lists to the program via Windows "Send To" Menu. So, and now is "Blank And Secure" in the Windows Explorer context menu (... see Image-3 Arrow-1)! Add to "Send To" Windows Context Menu in MS-Explorer! Paste via right-click on an empty area! BlankAndSecure in Explorer context menu! 3.) 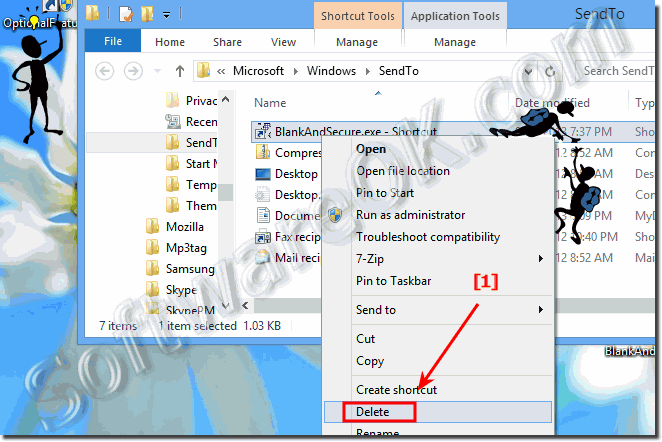 Remove from the "Send To" context menu in MS-Explorer! Works just like adding! Please press the [Windows R] key combination and enter in the Run dialog the command shell:sendto to open the SendTo directory (folder) in MS Explorer. Click the right mouse button on security option "Delete" to remove the program from send-to menu. (... see Image-4 Arrow-1)! Remove Delete from Explorer context menu (Windows 7,9,8.1, XP)? Other options to transfer files or lists of files to "Blank And Secure"! You can drag and drop files or lists of file, from the MS Explorer and other programs on the BlankAndSecure.exe (... see Image-5 Arrow-1) or on the the program itself (... see Image-5 Arrow-2)! To ad the save delete file to right click "Send to Menu" is Suitable for Windows 10 (Redstone 4 & 5) Pro, Enterprise, Home, Windows 8.1, Windows 8, Windows-Server 2016, 2012, 2008, Windows 7 Basic, Professional, Starter, Ultimate a nice easy way to erase files and folders easier via MS file explorer context menu! 5.) From version 5.11 you can also shred the recycle bin / trash content! Added on user request! Please Register to the context menu version 5.11. (Image-6) Recycle Bin Contents Safe Delete via Explorer context menu! First time thanks for this great free software. I'm always enthusiastic about programs that are very small and can therefore be executed quickly. Also great is the Send-to and Context menu implementation and the very easy ways to set it up. What else I would wish for is the ability to pass files from the Windows Recycle Bin to Safe-Delete. This is not possible with drag and drop. Another approach would be to say SafeDelete, it should delete the Windows Recycle Bin completely safely. Background is above all that I have many photos. If I clear out the occasional, then I can in the example IrfanView with the button "Remove / Delete" directly in the trash to move without having to leave the full-screen photo view. This is so fast and I often come to a lot of excess images. Therefore, for me, the methods that we have so far with safe deleting are not really considered. Thus, I collect my pictures to be deleted quickly and easily in the "folder" trash and then wants this stack (yes, synonymous usually synonymous different source folders affected) can safely dispose of. And that Windows can only "uncertain". I hope you can come up with a solution. I also think that I've seen something like this in one of those inflated tuning tools (only had a demo, which was then deleted again) that you had the right to "Recycle Bin" with a right-click on the trash. From the version trash shredding is no longer a dream These screenshots have been made under Windows 10 and 7, as you can see above under Windows 10 shot screenshot. You can easily and fast use this example as a Recycle Bin Shredder Solution on both previous and older versions of Microsoft's Windows operating systems, whether it's a Windows desktop computer or you're on the go, or if you want to shred your tablet, Surface Pro / Go, or even as a Shredder on a server operating system. It really makes very good sense to use this trash shredding feature, it is a simple yet effective trash shredding tool, and once in a while it makes perfect sense to use this improved trash shredding feature; it has been tested and tested on various MS OS successfully verified. 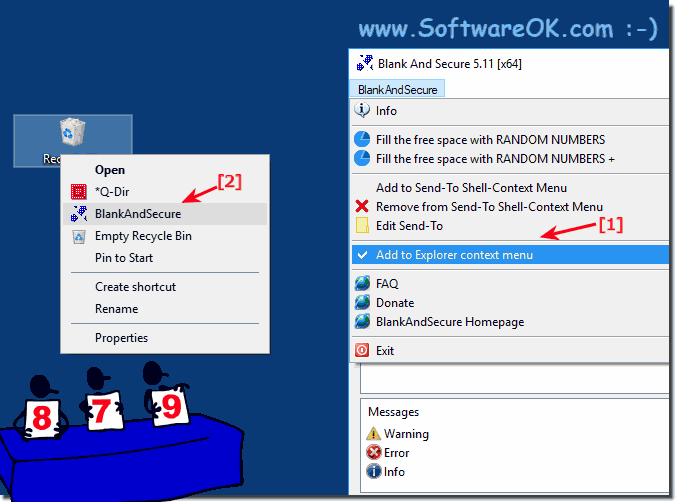 BlankAndSecure - FAQ-1: How to add to Explorer context menu (Windows 7, 8.1, 10)? How long does it take 35 times to overwrite files and random renaming? When selecting multiple files using explorer context menu, a separate instance of Blank and Secure is opened for each individual file.